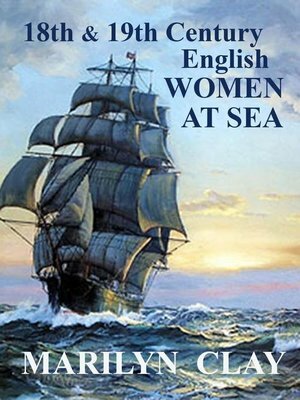 18th and 19th CENTURY ENGLISH WOMEN AT SEA is a lively and entertaining account of the three types of women one would normally find, legally, or illegally, on board a ship during the 18th and early 19th Centuries—prostitutes, officer’s and midshipmen’s wives and other female passengers during wartime, and women masquerading as sailors or crewmen. Colorful but factual accounts of surprising and certainly, little-known, incidents are drawn from letters written by sailors and other men at sea, from diaries of such figures as Admiral Horatio Nelson, and autobiographies written in the late 1700s by women such as Mary Lacy, who took to the sea masquerading as men and lived to tell of their experiences. Noted historians who have published works on the same subject are quoted and referenced. Best-selling, multi-published author MARILYN CLAY is a respected historian of the Regency period in English history. For sixteen years she published The Regency Plume, an international newsletter filled with well-researched articles useful to writers, historians and people interested in all aspects of the 18th and early 19th centuries in English history. In addition, Marilyn Clay was invited to contribute essays that were published in the Encyclopedia of Romanticism: Culture in Britain, 1780s – 1830s (Garland, 1992). Marilyn Clay's Colonial American historical suspense novels include DECEPTIONS: A Jamestown Novel, praised by The Library Journal and Booklist. To escape an arranged marriage, Catherine leaves England for Jamestown in search of her childhood sweetheart. What she finds in the New World nearly destroys her! SECRETS AND LIES: A Jamestown Novel. When four English girls travel to the New World on a Bride Ship to marry settlers and start families, they are instead shocked to discover that someone in Jamestown wants them all dead! BETSY ROSS: ACCIDENTAL SPY is another popular historical suspense novel by Marilyn Clay, set in Philadelphia in 1776. Quaker Betsy Ross sets out to uncover who killed her beloved husband John Ross, but is instead drawn into the dangerous and confusing underworld of spies and double agents. Available in print and e-book. Marilyn Clay’s Regency-set mysteries include: MURDER AT MORLAND MANOR, MURDER IN MAYFAIR, MURDER IN MARGATE and MURDER AT MEDLEY PARK, all available worldwide in print and Ebook. Kensington Books published many of Marilyn Clay’s Regency-set historical novels, all of which were translated to foreign languages. Titles include: Bewitching Lord Winterton, A Pretty Puzzle, Brighton Beauty, Miss Darby's Debut, The Uppity Earl, Felicity’s Folly, Miss Eliza’s Gentleman Caller, and The Unsuitable Suitor. Marilyn Clay’s newest Regency romance novel is titled THE WRONG MISS FAIRFAX. Two look-alike cousins in London lead a love-struck nobleman on a merry chase. If the confused gentleman cannot sort out who is who, he just might propose to the wrong Miss Fairfax. Marilyn Clay’s STALKING A KILLER is a contemporary murder mystery set in Dallas. Aspiring PI Amanda Mason must clear her own father from a murder charge before the killer strikes again. Marilyn Clay is also the designer of the Romance Writers of America’s prestigious RITA award. Marilyn was presented the first golden statuette when the RITA award was unveiled. For more information on the author visit her website at Marilyn Clay Author.